Contractors or employees? It’s the question that just won’t die for Uber. Is Uber treating its independent-contractor drivers too much like employees? A new national class-action complaint filed Sunday night against Uber in federal court in the Northern District of Illinois hopes to clarify the issue. It mirrors in several ways suits from Massachusetts and California, which were recently settled, with Uber agreeing to payments to drivers in those states that could total $100 million. The new suit, filed on behalf of former Uber driver Lorri Trosper by attorney Brian Mahany, who is best known for extracting a $16.6 billion settlement from Bank of America in a 2014 whistleblower case, would allow drivers from across the United States–though not in California or Massachusetts–to sign on. Uber’s California and Massachusetts lawsuits dealt with the much-debated issue of whether Uber treats its independent-contractors too much like employees–without giving them the benefits a full-time employee can expect (say, paid time-off, overtime, health insurance). In the settlement, Uber agreed to more clearly communicate with drivers over how they can be cut off from using Uber’s platform and provide a few more services to drivers in Massachusetts and California. Since the April 21 settlement, a handful of other complaints have popped up around the country–this Northern Illinois one, filed on behalf of hundreds of thousands of drivers nationwide, being the most recent. It asks the court to require Uber to classify its drivers as employees, and to award drivers unpaid overtime and expenses, as well as unpaid gratuities, plus equitable relief. 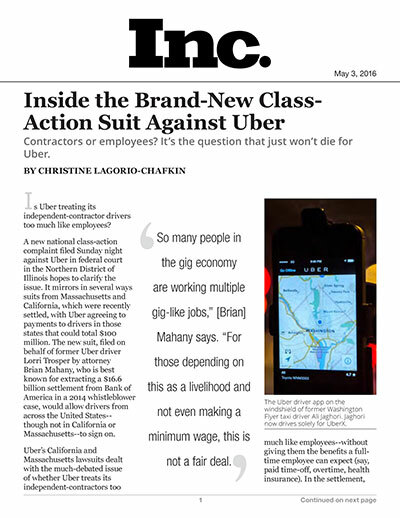 The new Illinois complaint uses former Uber driver Lorri Trosper as the plaintiff, and makes the case that she is treated like a full employee–while being classified as a contractor. “Tellingly, all that she does for Uber is directed and monitored by Uber. She does nothing in her day to day work activities that would evidence her being independent of Uber. All that she does in her job is controlled by Uber. She is not independent of Uber but is an employee of Uber,” the complaint reads. When we started Uber six years ago, we thought long and hard about whether to build a tipping option into the app. In the end, we decided against including one because we felt it would be better for riders and drivers to know for sure what they would pay or earn on each trip –without the uncertainty of tipping. That’s still the case today. Officially, tipping is not included, nor is it expected or required. Uber is the subject of more than a dozen lawsuits across the country. Most recently, Uber settled a separate lawsuit that alleged discrimination against blind passengers. The ride-hailing company agreed to pay the National Association for the Blind $225,000 and to ban from its platform any drivers who deny rides to blind passengers or refuse to allow a service animal into their vehicle. Uber did not, in the settlement, admit any liability or wrongdoing.